How do you cook without fire? The HydroHeatTM Flameless Heat Cooker is how we do it! By using only water and one of our Heat Packs, you can cook your freeze-dried and dehydrated food anywhere you are! Because the heating process requires no fire, it is safe to use where fire is out of the question, such as while driving, at the office, at home during a power outage, or even while camping or hunting in areas where fire is prohibited. The HydroHeatTM Flameless Heat Cooker is your safe, portable option for cooking no matter where you are. *Caution: Steam, water, and contents will be hot! Contents: 1) Hydroheat Flameless Cooker and One Large Heat Pack. Directions: Prepare food in stainless steel bowl according to food directions. Add 1/2 cup of water to plastic cooker. Remove large heat pack from wrapper. Place in Water. Insert stainless steel bowl over heat pack and water. Snap on lid and heat for 5-30 minutes. Stir occasionally. Cook times may vary. 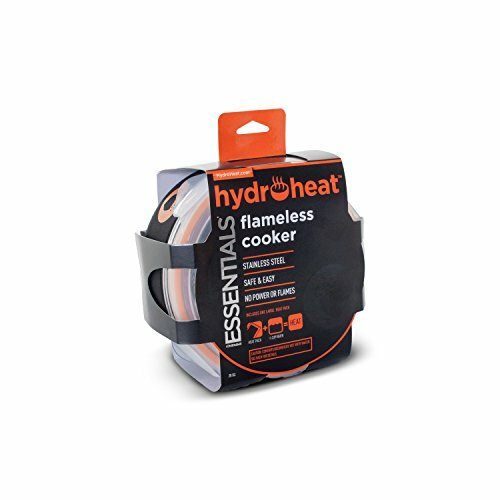 If you have any questions about this product by Hydroheat, contact us by completing and submitting the form below. If you are looking for a specif part number, please include it with your message.